Pilates was originally developed to stretch, strengthen and balance the body. Nowadays, we use these Pilates principles to improve your strength, mobility and flexibility. In our purpose built Pilates studio at our clinic on Gloucester street, our Pilates classes are tailored to suit your needs. Regardless of your age and ability, we offer safe and effective individual and small group Pilates classes. Classes are taught by Physiotherapists and highly qualified instructors who really understand movement and can ensure a safe and effective exercise programme. 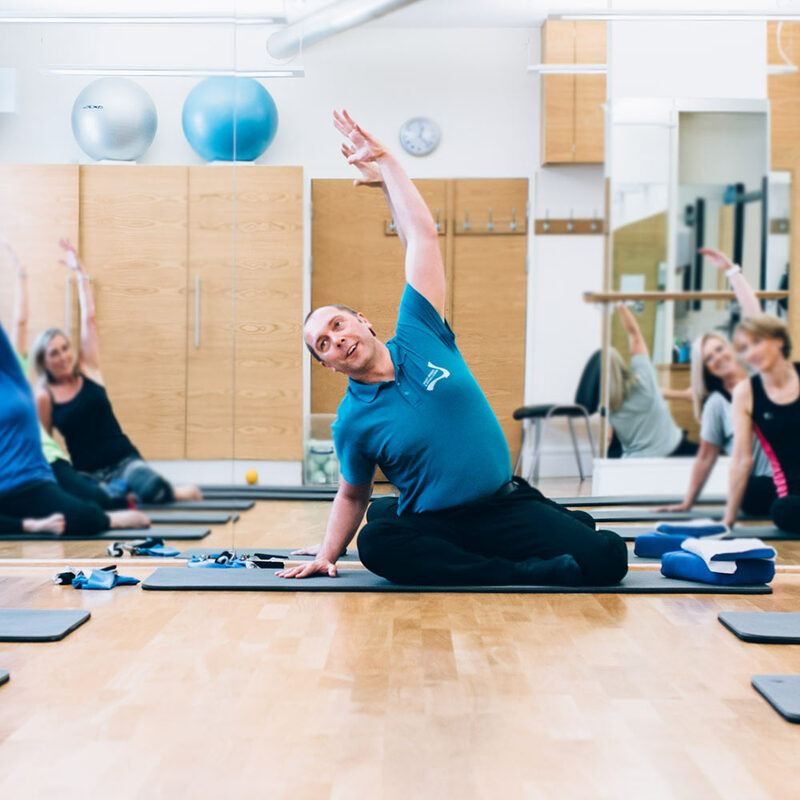 Our Pilates team is led by Nigel Mann who is currently the only local physiotherapist certified as a Modified Pilates instructor by The Australian Physiotherapy and Pilates Institute in Jersey. He is now ably supported by Emma Balderson (also a certified Modified Pilates instructor) and Kelly Cornick. Ordinary Pilates classes are great if your abilities more or less match those of others in the group, but our Pilates instructors tailors the experience to each individual. Drawing upon our experience, knowledge of exercises, skills, rehabilitation, anatomy and biomechanics, physiotherapists are best placed to appraise the latest research and apply it to our Pilates Classes. In order for you to get the most from your classes, we insist upon a 1:1. During this session, the physios or instructors will really get to grips with your uniqueness; your medical history and existing or resolving medical conditions, what your goals are. This helps the instructor to tailor your exercises and progress you whilst allowing for your unique circumstances. This way you get the most out of your classes. This is what makes us different. This is one of the reasons why our clients derive more benefit than attending an ordinary class. You will be given a tour of the studio, taught the basic principles and specific exercises unique to you. Then you are ready to commence your class. Our Pilates is all about the individual, but that doesn’t mean you have to miss out on the fun of joining others in group exercise. We only allow 9 people per class and keep class sizes small so you get plenty of attention and expertise from the instructor as well as the social and motivational benefits of group exercise. Pilates is great for injury prevention, especially in high-impact sports. The idea is to heighten your awareness of your own body - promoting strength and flexibility while avoiding excess strain on joints. As physiotherapists, we are experts in recovery and pain management. Pilates is a complimentary exercise to your recovery programme. Exercises can be modified to suit your personal circumstances so you don’t need to worry that you’ll aggravate your injury by taking part. It’s a great form of exercise for people who want to (re)start their exercise journey safely. Our Pilates and Physiotherapy services work together to ensure that your exercises are gradually progressed to reflect your improving condition. Have you been instructed to “brace your stomach and exercise”? if so, please stop. It may seem that the differences are subtle but, we know the difference and so too will you when you give our Pilates classes a try. Modified Pilates has been developed by the Australian Physiotherapy and Pilates Institute (APPI) and is the culmination of years of both physiotherapy and Pilates training. The APPI have incorporated traditional Pilates exercises with a research base of available evidence for physiotherapists to use in rehabilitation. Modified Pilates is unique in that it is delivered exclusively by chartered physiotherapists. At the Jersey Sports & Spinal Clinic we know the benefits of Pilates if it is done correctly. As clinical professionals, physiotherapists have an in-depth understanding of movement, posture and injury rehabilitation. For your benefit, our classes are run either on a 1:1 basis or in small groups. There are a maximum of nine people per class. This ensures that you are given ongoing feedback and reassessment during the classes. The exercises are tailored to your individual needs and progressed only when you are ready. + WHAT ARE THE KEY BENEFITS? Modified Pilates is suitable for everyone, regardless of age or fitness levels. The movements are generally not aerobic so cardiovascular fitness is not necessary. Our classes are predominantly Mat-Based classes, but we can easily modify your programme according to your needs. Like any exercise program, if you have any problems you should consult with your doctor before participating in a Pilates class. Full advance payment for a course will be required to secure a place. If you do not attend your class , it will not be possible to make up this class in the future. In the case of early retirement or of failure to attend the full course once confirmation of a place has been given by The Jersey Sports & Spinal Clinic and accepted by the participant, all previously paid fees are non-refundable. However, at the absolute discretion of The Jersey Sports & Spinal Clinic, provided that 2 weeks’ written notification prior to the commencement of the course has been given, a pro-rata refund may be considered for participants. If you have paid at a discounted rate, a full fee may be applied to classes already undertaken. The Jersey Sports & Spinal Clinic reserves the right to charge an admin fee of £25 in all circumstances. Any decision made by The Jersey Sports & Spinal Clinic will be final. To meet demand, our Pilates Classes tend to follow the school term timetable. Beginners classes are hosted regularly throughout the year and are approximately six weeks in duration. Improver, intermediate and advanced classes are up to twelve weeks duration. Why not get in touch with us to find out availability and to book your 1:1 and class. Cost per class with 9 participants: £14.50 /class payable by monthly direct debit. Full advance payment for a course will be required to secure a place. All classes will be held at The Jersey Sports & Spinal Clinic’s studio: First Floor, 14 Gloucester St., St. Helier, Jersey JE2 3QR. All participants must attend an introductory 1:1 with a physiotherapist before commencing a course of Pilates classes. In this way we can identify the areas you need to work on and structure the classes to give you maximum benefit. Our classes are run by experienced chartered physiotherapists and Pilates instructors. There are a maximum of 9 people in any one class. Pilates classes must be pre-booked. All dates are inclusive. If you do not attend your class, it will not be possible to make up this class in the future. If these class times are not convenient, we can also offer 1:1 classes instead.